Offering instruction, inspiration, and resources that encourage your curiosity and fuel your innate desire to create. Learn to weave or dye on your own time with excellent step-by-step video tutorials and written instructions. Each course covers all of the material taught through my workshops as well as techniques not covered due to time constraints. Lucky you! 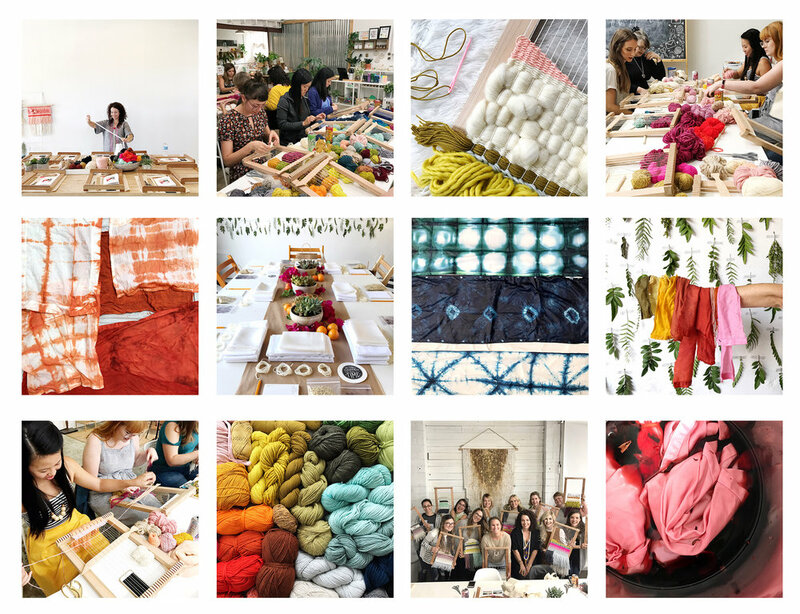 Join an upcoming workshop and learn to weave or dye with other creatives in your area. The convenience of hands-on guidance, encouragement, and a fun group setting at one of the many gorgeous venues across the country make this a popular option. Artisanal tools and supplies included! Purchase locally made and sustainable hardwood looms, weaving tools, natural fiber packs, indigo dye kits, and custom shibori tools from my shop. They say you're only as good as the tools you use, right? Well, ours are pretty good. Rachel had such a warm welcoming energy about her. She was open to any technique discussions and shared all her secret tips. Her class was the perfect amount of exploration and practice.